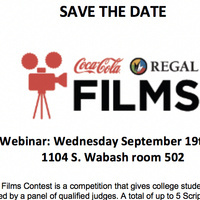 The Coca-Cola Regal Films Contest is a competition that gives college students the opportunity to enter a script that will be evaluated by a panel of qualified judges. A total of up to five scripts will be selected as finalists and each finalist team of students will have the opportunity to produce a film based on their script that will be judged again in a competition for the grand prize. The winning team may have their film screened nationally across select Regal Cinemas locations. To receive an application, contact production@colum.edu. Application deadline is October 5, 2018.